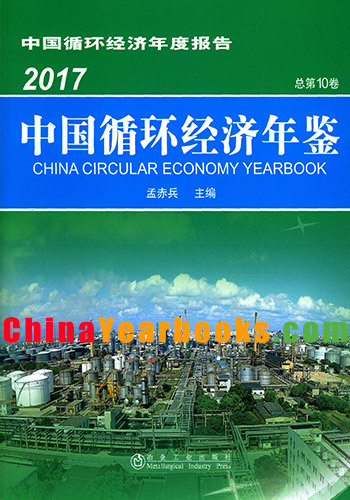 The Chinese Circular Economy Yearbook is a large-sized reference book tocomprehensively record recycle economy history in our country.It adheres to the philosphy ofgreen growth proposed by the general secretary of the CPC Central Committee Xi Jinping andpromotes green growth,circular economy,low carbon economy,the consrtuction of ecologicalcivilization and bertuful China. Since Chinese Circular Economy Yearbook is published for the first time in 2008,it isalways welcomed and praised.Those compliments strongly encourage us to keep makingendeavors to edit Chinese Circular Economy Yearbook. The Chinese Circular Economy Yearbook 2017 records the development of ChineseCircular Economy in 2016 with the text mode combining with articles,entries,forms andpictures. The Chinese Circular Economy Yearbook 2017 has some distinct characteristics,such asall the affairs,information,data,materials and pictures inside coming from official resourcesor publications with authority and reality;It is comprehensive,systematic and full contentcovers from the central government to local government and enterprises,industrial parks,every industries,areas,speeches,important events and affairs,laws,policies,sciences andtypical cases;It involves in every aspects of the recycle economy from different levels and allorientations;It collects nearly portraying the recycle economy in our country and hence it isinteresting to see and read. The Chinese Circular Economy Yearbook 2017 records experiences from recycle economyexperimental units which enhances its reference value. During the edition of the Yearbook,it is highly appreciated for the strong support fromthe ministries and commissions of the State Department,every province,cities,municipalitiesand cities specifically designated in the state plan,Guiyang City,the Development andReform Commission of Xinjiang Production and Construction Corps of CPLA,every nationalimportant industries and their associations,recycle economy experimental units. The newsroom of the Yearbook is located in Beijing Modern Recycle Economy Academy(010-84119310,[email protected]). Due to limited experiences and level,please don’t hesitate to let us know if there’s anyomission and error.